Diversity of water-borne fungi in stemflow and throughfall of tree canopies in India. K. R. Sridhar & K. S. Karamchand (2009) Diversity of water-borne fungi in stemflow and throughfall of tree canopies in India. 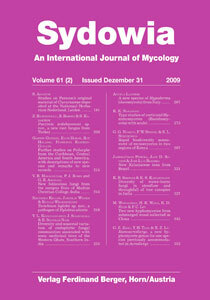 Stemflow and throughfall of 14 non-riparian tree species of the southwest coast of India represented conidia of 63 water-borne hyphomycetes (conidial shape: three conventional, six sigmoid, six helicosporus, 48 multiradiate) consisting of 19 species as new record to the tree canopies. Anguillospora crassa, A. longissima, Flagellospora curvula, Trinacrium subtile, Triscelophorus acuminatus, Trisulcosporium acerinum, and Ypsilina graminea were dominant. The species richness of water-borne hyphomycetes was highest in stemflow of Ficus benghalensis and in throughfall of Artocarpus integrifolius. The conidial output was highest in stemflow of Tectona grandis and in throughfall of Ficus religiosa. The average conidial output per species of water-borne hyphomycetes was highest in stemflow as well as throughfall of Tectona grandis. The Simpson and Shannon diversities were highest in stemflow and throughfall of Ficus benghalensis. The Jaccard’s percent similarity of water-borne hyphomycetes among the tree species studied was ranged between 19 % and 56 %.